A holiday experience you never will forget! Travel guide for Bijagos Islands. 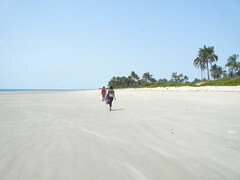 The Bijagos Islands, are a group of about 88 islands and islets located in the Atlantic Ocean and are part of the African nation of Guinea-Bissau. The Bijagos archipelago was formed from the ancient delta of the Rio Geba and the Rio Grande and spans an area of 2,624 km2 (1,184 sq. miles). Only some 20 islands are populated year-round, namely Bubaque which is where the Bijagos administrative capital is situated and is the most populated island, Bolama, Carache, Caravela, Enu, Formosa, Galinhas, João Vieira, Maio, Meneque, Orango, Orangozinho, Ponta, Roxa, Rubane, Soga, Unhacomo, Uno, and Uracane. There is a high diversity of ecosystems: mangroves with intertidal zones, palm forests, dry and semi-dry forests, secondary and degraded forests, coastal savanna, sand banks and aquatic zones. The archipelago was declared in 1996 a UNESCO Biosphere Reserve--Boloma Bijagós Biosphere Reserve, known for animals including marine turtles, hippopotamus and the southern islands are today a nature reserve. Bijagos is a truly beautiful. We can help you to plan your holiday with everything from hotel reservations, rentals and excursions. Subscribe to our newsletter and receive exclusive offers and the latest news about Bijagos.